Reading and share top 10 famous quotes and sayings about Polite Conversation by famous authors and people. 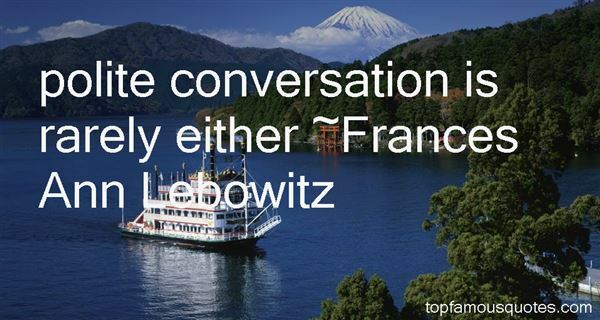 Browse top 10 famous quotes and sayings about Polite Conversation by most favorite authors. 1. "Neither question nor answer was meant as anything more than a polite preamble to conversation." 2. "Polite conversation is rarely either"
3. "I did note this, and set it down as yet one more of life's injustices: that the man who has been wealthy is dunned more civilly than the fellow who has ever been poor. My creditors would come to me most graciously, diffident, if not downright apologetic, for asking what was theirs. It was as if I would be doing them a great, unlooked for kindness if only I would pay them a trifling sum on my outstanding debts. I would give them tea, and polite conversation, and, even when my answer to their just entreaty had to be a regretful, "Nothing, sir, " my mortification was always entirely self-inflicted, for their civility never failed"
4. "Congress's definition of torture in those laws - the infliction of severe mental or physical pain - leaves room for interrogation methods that go beyond polite conversation." 5. "Every person of intelligence should be able to use his mother tongue correctly. It only requires a little pains, a little care, a little study to enable one to do so, and the recompense is great.Consider the contrast between the well-bred, polite man who knows how to choose and use his words correctly and the underbred, vulgar boor, whose language grates upon the ear and jars the sensitiveness of the finer feelings. The blunders of the latter, his infringement of all the canons of grammar, his absurdities and monstrosities of language , make his very presence a pain, and one is glad to escape from his company.The proper grammatical formation of the English language , so that one may acquit himself as a correct conversationalist in the best society or be able to write and express his thoughts and ideas upon paper in the right manner, may be acquired in a few lessons." 6. "Beside him a tiny elderly woman was leaning on a cane, studying him with curiosity. Since good manners seemed to require that he speak to her, Jon cast about for some sort of polite conversation pertinent to the occasion. "I hate funerals, don't you?" He said. "I rather like them," she said smugly. "At my age, I regard each funeral I attend as a personal triumph, because I was not the guest of honor." 7. 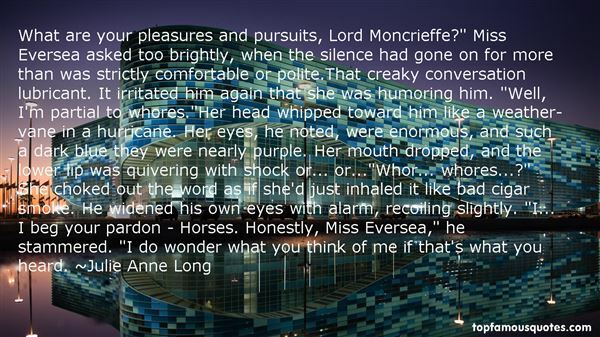 "What are your pleasures and pursuits, Lord Moncrieffe?" Miss Eversea asked too brightly, when the silence had gone on for more than was strictly comfortable or polite.That creaky conversation lubricant. It irritated him again that she was humoring him. "Well, I'm partial to whores. "Her head whipped toward him like a weather-vane in a hurricane. Her eyes, he noted, were enormous, and such a dark blue they were nearly purple. Her mouth dropped, and the lower lip was quivering with shock or... or..."Whor... whores...?" She choked out the word as if she'd just inhaled it like bad cigar smoke. He widened his own eyes with alarm, recoiling slightly. "I... I beg your pardon - Horses. Honestly, Miss Eversea," he stammered. "I do wonder what you think of me if that's what you heard." 8. 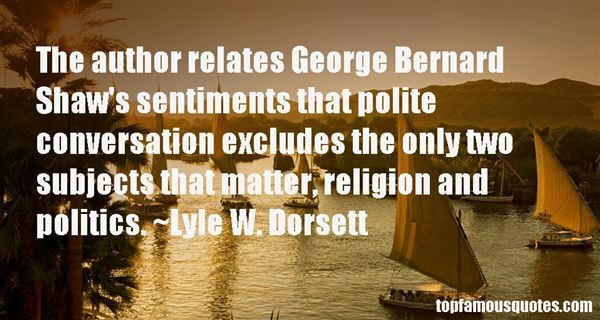 "The author relates George Bernard Shaw's sentiments that polite conversation excludes the only two subjects that matter, religion and politics." 9. "We need a language that lets us scribble and smudge and smear, not a language where you have to sit with a teacup of types balanced on your knee and make polite conversation with a strict old aunt of a compiler." 10. "Silence is a mirror. So faithful, and yet so unexpected, is the relection it can throw back at men that they will go to almost any length to avoid seeing themselves in it, and if ever its duplicating surface is temporarily wiped clean of modern life's ubiquitous hubbub, they will hasten to fog it over with such desperate personal noise devices as polite conversation, hummin, whistling, imaginary dialogue, schizophrenic babble, or, should it come to that, the clandestine cannonry of their own farting. Only in sleep is silence tolerated, and even there, most dreams have soundtracks. Since meditation is a deliberate descent into deep internal hush, a mute stare into the ultimate looking glass, it is regarded with suspicion by the nattering masses; with hostility by buisness interests (people sitting in silent serenity are seldom consuming goods); and with spite by a clergy whose windy authority it is seen to undermine and whose bombastic livelihood it is perceived to threaten."